It’s great that lots of people watch the Council meetings, but those meetings include final decisions. 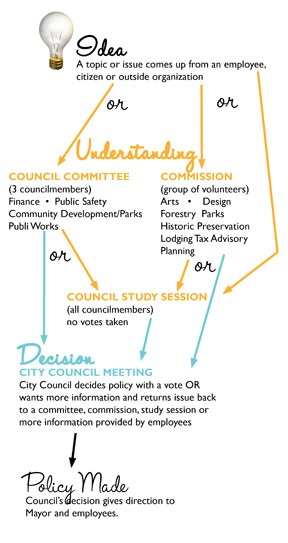 To really track an issue, you’ll want to start at the beginning along with the City Council. When an issue arises, either from a councilmember, from staff or from a member of the public, it gets referred to either a City Commission or a City Council Committee. A Commission is comprised of volunteers who either live in the City or have expertise in a certain area. Commissions can make recommendations to the City Council or use a Council-approved budget for specific topics such as the Arts or Forestry, but they may not make policy decisions. GET YOUR OPINION HEARD: Commissions and Committees typically meet once a month at City Hall. All meetings are open to the public to attend. Check the calendar for dates and times. You are also welcome to contact your councilmembers at any time to provide your thoughts. Once the Commission or Committee believes they understand the topic sufficiently, they forward it on to the full Council. If the topic is complex, they forward it to the Council Study Session in which all councilmembers get a briefing of the issue with no decisions having to be made yet. Sometimes, if an issue is time-sensitive or appropriate for the full council to hear, it may go to the full study session without first going to a Committee or Commission. If a Commission or Committee believes a topic is ready for a decision without another full Council briefing, the issue can go straight from the Commission or Committee to the full Council at a Regular Council Meeting in which a decision may be made. GET YOUR OPINION HEARD: Study Sessions are typically the second and fourth Monday of the month. They are open to the public to attend although there is no public comment portion. Check the calendar for dates and times. You are also welcome to contact your councilmembers at any time to provide your thoughts. Council Meetings in which decisions are made are scheduled for the first and third Mondays of the month. However, special meetings may be called with 24 hours notice if action is necessary before the next Council meeting. Notices of meetings are posted on the doors to City Hall’s Council Chambers or on the website. GET YOUR OPINION HEARD: When you attend a Council meeting, you may just listen or share your thoughts with the Council. If you want to speak to an item on the agenda, the Mayor will ask for public comments when that issue is being discussed. If you want to speak to an issue with a public hearing, sign up when you enter on that topic’s page, and the Mayor will call you when he opens the public hearing during the meeting. If you want to speak about something not on the agenda at all, sign up for Public Comment when you enter the Council Chambers. Public comment offers you up to five minutes to share with the Council your thoughts. You must share your comments from the podium and are requested to provide your name and address for the record. Your comments may not be about an election campaign and should be respectful in nature. This is time for the Mayor and Council to hear from you and is not a forum for engaging in a debate or discussion. If you have a question or need follow-up, the Mayor will help guide you toward the City employee or official who can best help you. Presentations made to the Council are scheduled in advance through the City Clerk. If you would like to share a presentation with a visual program such as slides, the City will review the program ahead of time to ensure appropriate content for the meeting and its airings on television.